Dragonfire Gate Buckers offer sweet warm growl, raw mojo and Southern sound. The AlNiCo 2 (A2 / Alnico Two) magnets in these pickups provide warm, creamy tone for a faithful vintage sound while maintaining airy treble performance. Dragonfire True Texas Strat pickups offer big, blue, truly Texas tone with a more modern wound sound. 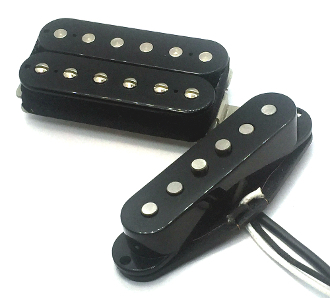 The AlNiCo 5 (AV / Alnico Five) magnets in these pickups are highly charismatic and provide warm, smooth tone for a less harsh result. Uniting these pickups together for the True Gates HS Set can provide you with vintage authenticity, Texas tone, midrange focus, strong bass and strong highs plus unique tone and sparkling character. Measurements provided are approximations; expect variability.